If your runs double as your own personal Jay-Z concert (often with special appearances by Katy Perry and Eminem), you may be boosting your performance without even realizing it. Why? It’s all about song BPM — a.k.a beats per minute, or the measurement of a song’s pace. Your brain has an inclination to sync your foot steps with the beat in your ears, which is why the best running songs can actually help you run more efficiently. “Humans have a natural predisposition to respond physically and emotionally to music — it is almost as though we are ‘hardwired’ to respond to it,” says sports psychologist Costas Karageorghis, Ph.D., author of Applying Music in Exercise and Sport. Music stimulates the part of the brain responsible for regulating wakefulness (the ascending reticular activating system) which energizes us and makes us want to move, he explains. Karageorghis has authored more than 100 studies on the relationship between music and athletic performance. 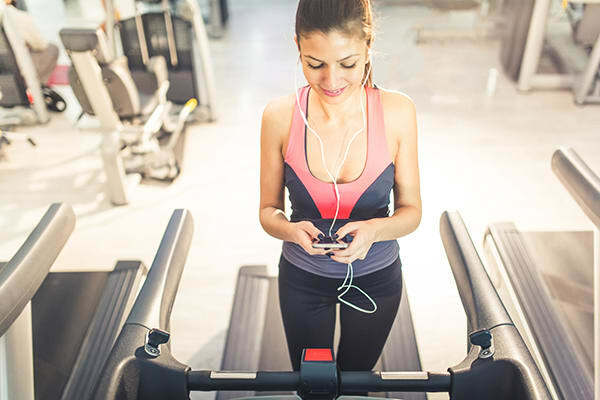 His findings show that listening to music while pounding the pavement can enhance mood by 10 to 20 percent, reduce perceived exertion by 10 percent, delay time to exhaustion by up to 15 percent, and significantly increase the likelihood of entering a flow state, in which your brain goes into auto-pilot because you’re so immersed in the enjoyable experience. This means that the best running playlist isn’t just good for keeping you distracted while you run, but it can actually help your performance. And Karageorghis’ findings aren’t limited to running. His team published a small study in the The Journal of Sports Medicine and Physical Fitness and found that cyclists who match their cadence to music tempo can reduce oxygen consumption by seven percent, as compared those who listened to unsynchronized music. “When movement is synchronized to music, the body becomes more energy efficient,” he explains. And that, in turn, can have a profound effect on endurance. Can the Right Song BPM Help You Run Faster? So if your body will match your running cadence to the song BPM, can you hack your brain to increase your speed? Yes, you can. “Running with music is one of the ways I gradually adapt a runner to a slightly faster cadence,” says Janet Hamilton, C.S.C.S., founder of Running Strong Professional Coaching in Atlanta. “However, studies show that if you make changes to your natural cadence greater than about 5 percent,” she says,” you’re likely to feel an increase in perceived exertion and a decrease in running economy.” (Meaning it will feel harder and take more effort.) Because of this, Hamilton recommends introducing gradual changes to your selected song BPM — to the order of two to six steps per minute — giving your body time to adapt. This hack might not work for all kinds of runs, though. Karageorghis’ research shows that matching your cadence to a song’s BPM only benefits a low- or moderately-intense run. “At running intensities above 75 percent of aerobic capacity, music is ineffectual at reducing perceived exertion,” he says. That’s because your brain is flooded with fatigue-related cues and it becomes much harder for it to process the music. Pick your running music to match your kind of run for optimal results. Even so, it can still elevate aspects of your mood, such as happiness, and excitement, and that can make the experience much more enjoyable overall, Karageorghis says. What Is the Ideal Song BPM for Running? When it comes to running tunes, not all songs are created equal: “For music to have a rousing effect, it needs to be both loud and fast,” Karageorghis says. The sweet spot for the music being loud enough without damaging your hearing is 75 to 80 dBA (about the volume of a vacuum cleaner), he adds. Songs greater than 120 BPM are a good place to start, but depending on your running goals, you might need a specific BPM range. If you have music playing just to soundtrack your run—(i.e., in the background without conscious effort to synchronize your stride withit) — Karageorghis says the ideal tempo range is 120 to 125 BPM for a jog and 140 to 145 BPM for an all-out effort. If you’re aiming for synchronicity (to keep your running at a consistent pace, or if you’re trying to increase your cadence as Hamilton mentioned above), then the ideal tempo range is 150 to 180 BPM. Keep in mind, there is no one single right cadence for all runners, says Hamilton. “One hundred eighty beats per minute is often thrown out as the magic number, but research shows that, like all ‘ideal’ numbers, there’s a standard deviation that surrounds it,” she explains. That’s why it’s so important to determine your cadence and BPM for yourself. Run on a treadmill at your normal, easy pace. Set a stopwatch for 60 seconds, and have a friend count the number of times your right foot strikes the ground. Take that number and double it (you only counted for one of your two feet, after all). That’s your natural cadence in beats per minute for a normal, easy run. You can run faster than this speed, but your cadence should be increased gradually — to the order of two to six steps per minute — giving your body time to adapt. Once you’ve got your number, it’s time to choose your personalized BPM playlist. “You can use music with a tempo that either exactly matches your steps per minute, or select a tempo that is exactly half of your number and take two steps per beat,” Karageorghis says. If you’re going with half pace, opt for “rhythmically busy” songs like hip hop, instead of a ballad or slow rock, he adds. Another thing to consider is the lyrics, which can help with your motivational state, Karageorghis explains. (That explains why Cake’s “Going the Distance” and Eminem’s “Till I Collapse” are staples for most running playlists.) But even if those songs match your running BPM and are filled with inspirational words, it won’t do you much good if you don’t actually like listening to them. It’s just as important to pick songs you enjoy. “During running, you are far more likely to have a positive mood response to music that you like,” Karageorghis says. Luckily, there are apps that will tailor your favorite tunes to your desired song BPM, like Spotify Running, which will automatically sync up to your steps and play songs suited to that beat. RockMyRun and Jog.fm will let you choose a BPM-specific playlist filled with your musical preferences, such as a playlists of pop songs at 160 BPM. And if you’re looking for a BPM finder that will tell you where your favorite song lands on the chart, check out SongBPM.com. But we’ll help you get running on the right foot with these sample BPM playlists that match paces for 120 to 180 BPM.